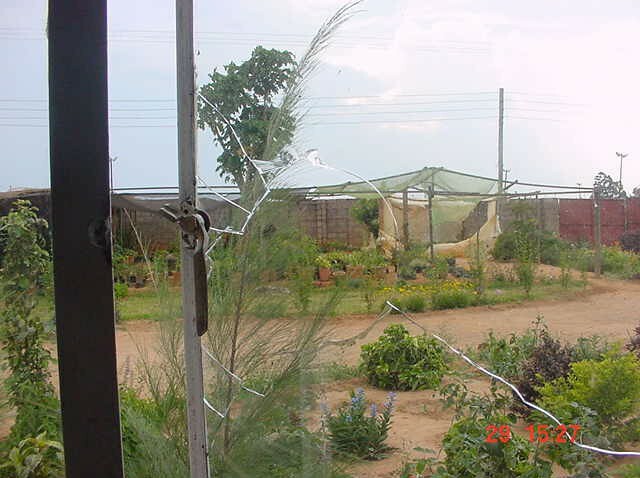 Kalomo was a tiny little town with only two tarred streets and a highway running across, that linked several farming towns in the Southern Province of Zambia and the rest of the country. The population of the town then, according to statistics was five thousand. We knew almost everyone who lived there, or at best they knew us because of where we lived, right in the business part of town. Behind our house was a BP gas station, while the front of our house faced the highway. The Police station and camp for police officers and their families were on our west; while behind us were the shopping center, government offices, and homes for Indian businessmen and their families. From my bedroom window, we often watched as buses in transit stopped to refuel and people took a bathroom break. Because there were no restrooms for customers at the gas station, people would run behind the station and hide behind shrubberies to relieve themselves. The wall of mulberry trees that hedged our house from the rest of the area must have appeared impenetrable to people far away, but we could see right through it. Men leaned into the gray wall fence at the back of the gas station and urinated against it. Women squatted wherever they thought there was privacy and did their business, whatever it was. Meantime, we stood behind the curtains watching and laughing at people’s bizarre toilet manners. Sometimes a few people, unable to use the bushes or squat just anywhere would come knocking at our door and ask if they could use our toilet and have some water to drink. We never turned anybody away until we learned about the advent of Aids in 1987. The initial mystery of Aids made my mother put a stop to that generosity and hospitality. I graduated from high school in 1986 and worked at three different jobs by 1991. I worked at a butcher’s for half a year, taught elementary and middle school kids for one and a half years and spent the last two years working at Lima Bank. By January 1991, I decided I was breaking out of the tiny little rural town of Kalomo, I was going away to the provincial capital, Livingstone. I was fed up of keeping company with workmates who looked down on me just because they had spent a year or more in college and came from bigger cities. I was tired of people thinking that I was too young to date. I was especially irritated at the boldness of men older than my father thinking I would play the role of mistress to them, for a better living. I was indignant of their attitudes that said I would live a miserable life of want just because I would not accept their advances. I despised some of my bosses who made me a mail runner to their girlfriends and did not care that I knew their respectable wives. I was tired of the hypocrisy of men who cheated on their wives and claimed to be the most honest workers in the industry. I was weary of fellow Christians thinking I was not a good enough Christian just because I dated a guy who did not belong to our church. I was tired of trying to be a writer and yet being so scared of unknown critics. By 1991 I was feeling rather inadequate that my boyfriend of more than four years had completed his degree studies, was looking for a job out in the big city of Lusaka and he was not writing to me like he used to when he was in college. Had I not been trying to be a better Christian by letting go of him as my Pastor’s wife had advised? I had been through a lot of trials and a lot of suspicions because of him. I wanted to walk away from the relationship but could not muster the courage and the pain. I played and felt guilty about my relationship all the time for no reason at all. I should have been free to hold his hand and proudly walk with him on the streets, instead of hiding him like he was something wrong, for a high school graduate that had her own job and, little home. I should have been proud of the young robust love we shared, instead of committing it to the rocks and bushes and hidden pathways where no one saw us. I should have been proud to proclaim that he was my boyfriend, but my ignorant faith kept me from enjoying that part of my youth with him. I should have shared just how pure our love for each other was, how undemanding and unflattering, but I did not, I just hid and suffered humiliation for nothing. A lot of people thinking I had no one I loved, tried to match me with men to marry me that were not my taste or could not beat that hidden love, even if they were Christian men. My dad still had high hopes for me even if neither him nor my mom would let me leave my lucrative job at Lima Bank and go to college. I had high hopes for my life and Kalomo would not be my destination, I was standing up, I was growing wings and taking flight. The only problem, I did not have enough money to get me a ticket and the basic requirements to get into college. However,I was equipped with a faith that was stronger than most thought I possessed, because of my often trials and a loyalty that tended to make me walk the middle path. For four good years after school, I had been accepted to all the foreign universities I could apply to, except the colleges and universities in Zambia, our country. To get a scholarship to attend a foreign university, I had made applications to all businesses, local and international, sending them self-addressed envelopes to enable them to respond to me. None of the international companies responded (may be because I did not send them self-addressed envelopes), but I received responses from almost all the local companies telling me that they were not able to help me, unfortunately. Before I resigned my job at the Bank, I applied for company sponsorship to study Banking by long distance or Shorthand and Typing at Livingstone Trades Training Institute, where I had been accepted for the January enrolment of 1991. As the year 1991 rolled in, the company had not yet responded to my request, so I took off based on a discussion and agreement I had reached with God in secret, He had assured me He would take care of me. It was a tricky situation that I could not share with anyone. I was too afraid to ask my parents for money because they had been against me resigning my job and too, they had a lot of other responsibilities. Besides, I had been working for four good years and I was sure they expected me to be able to sponsor myself. I had thought I would use my last salary towards the first year of payment for college, but I was told the company would not pay me because I had not given enough notice. Devastated, I still left anyway. My mom gave me some cash and I went and stood by the roadside to wait for a ride from truckers (there were always a lot of them on that road). It was not long before a Zimbabwean truck driver came by and gave me a free ride (as I had expected) to Livingstone. He dropped me off at the college campus a few hundred miles from where he had picked me, it was way out of his route, but he was a good man. He even promised to bring me a new pair of dress shoes on his way back. I never saw him again, I do not know if he died, forgot my name, lost his job or met someone else on the way who he promised to buy a pair of shoes too. I told you about my faith, most were not very sure of how strong it was. As I entered college they warned me about how people changed when they went to different cities, how their faith diminished and began to live just like everybody else. College to me was a chance to live out my faith in an unfamiliar place, away from the good influence of family and people I knew. It was an opportunity especially, to start with practically nothing, trusting God to take care of me. I would be looking out for the Zambia Fellowship for Evangelical Students to join them from the start and I did. My prayer for a Christian friend was answered the moment I stepped on campus and sat to wait for the Admissions officer. My new friend, Mwansa, was the key to many of my blessings in school, everything I lacked, she had. She shared everything with me without waiting for me to ask, she simply saw my needs and met them graciously without ever letting others know about it. I remember feeling embarrassed and teary eye because I di dnot have the bucket needed and a pair of slippers for me to be able to use the shower rooms. Mwansa finished showering the first evening in college, called me in private, gave me her pink slippers, bucket and towel to use. I had my own face towel. I will forever be grateful to her for that graciousness. Mwansa would be my friend for the long haul, in college and beyond. The first day I stepped into the entertainment hall that we were using for our fellowship meetings, my eyes landed on a tall, thin, dark guy in a purple silk shirt with black squares in it. I knew for some reason that he would be my future husband; it was surprising because it took a while before I fell in love with him. I was still in love with someone else at the time. The Fellowship for Evangelical Students would be another window and door to the outside world for me, the main one being college itself. College offered a lot of temptations for young women in terms of dress, looks, possessions, the food one ate, snacks we could afford, music and accessories. Many older men from around Livingstone took advantage and would flock to college in the first few months of each new school year to look for unscrupulous young women to court. Of course, each one of us was a potential pick, but I had made a choice as the English say, forewarned is forearmed, I would not fall prey to married men and those seeking to have a good time. I chose to trust God and not be swayed by the promise of material things and other temptations. I was there to study and I would excel academically and spiritually. 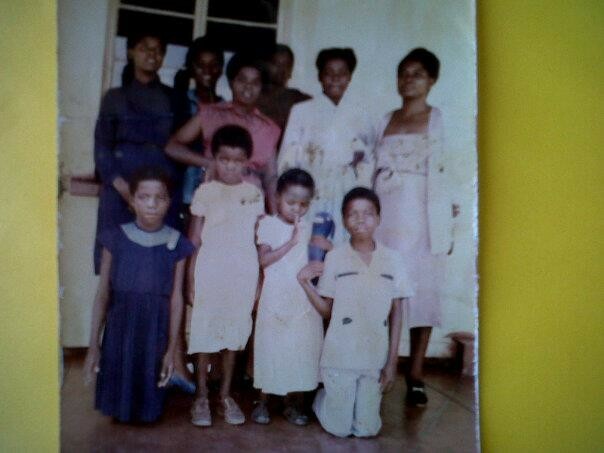 A photo (dug by cousins from the archive) we took in the verandah of our house in Kalomo. Here we posed, facing the highway, in 1989. I am wearing in dark blue at the back on the left. My mom (in pink) is upfront on the right. Next Next post: Should I share my diary with you?